Eindhoven is the centre of a new european photonics project. A new European photonics project has kicked off in Eindhoven this week. The R&D costs that are involved in developing photonic chips are high, 12 partners from northwestern Europe are creating an open access pilot line that will drastically reduce costs and time for the pilot production of new products. The facility is meant for shared use by European SMEs. The 14 million euro project (OIP4NWE) is supported by the European Regional Development Fund and led by the Eindhoven University of Technology. The production facility that is going to be built is expected to create a thousand new companies and thousands of jobs. It should be fully operational in 2022. 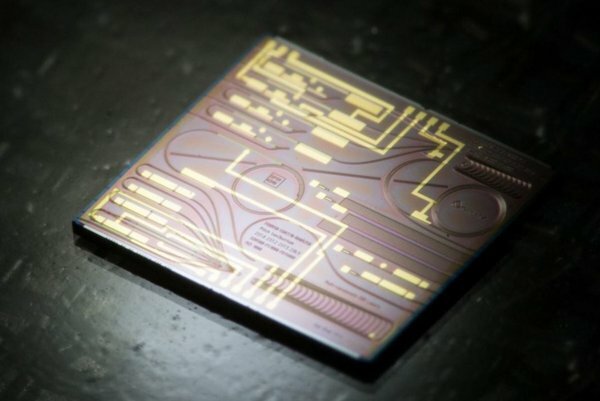 After two decades of basic photonics research, the first companies producing photonic integrated circuits (PICs) are now taking off – sparsely. One of the main hurdles is the high cost involved in R&D. Not only does the PIC production require expensive high-tech equipment installed in cleanrooms, but currently the production processes still have a high defect rate and are too slow. This was workable for basic research but not for commercial R&D. The production of PICs on wafers will be realized in the existing NanoLab@TU/e cleanroom at Eindhoven University. The PICs of different companies will be combined on one wafer to keep costs low. The back-end process is done at the Vrije Universiteit Brussel (Optics for beam shaping and light coupling) and at the Irish Tyndall National Institute (Assembly of fibre-optic connections and electronics in the package). All steps require nanoscale precision to avoid product defects. The other parties involved are the companies AIXTRON SE (Germany), SMART Photonics, VTEC Lasers & Sensors, Technobis Fibre Technologies (all Netherlands), mBryonics Limited (Ireland) and Oxford Instruments nanotechnology Tools (United Kingdom) along with research centers Photonics Bretagne (France), Cluster NanoMikroWerkstoffePhotonik (Germany) and Photon Delta Cooperatie (Netherlands).